Address: 9 Queen Street, Hadleigh. 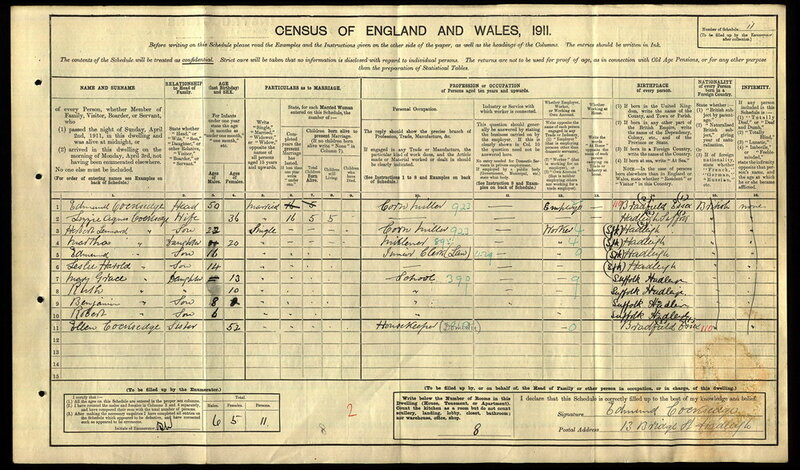 Leslie was born in 1897 at 13 Bridge Street, Hadleigh into a milling family. His father Edmund and his father’s brothers worked the wind mill that once stood at the top of George Street and the water and steam mill on Bridge Street. In 1911 he was 14 years old and still living at 13 Bridge Street with his father Edmund, his step-mother Lizzie and his siblings; Herbert (22), Martha (20), Edmund (16), Mary (13), Ruth (10), Benjamin (8) and Robert (6). From early in 1916 recruiting was no longer done on regional lines and new recruits were sent to join battalions that needed manpower and Leslie was one such recruit. Although Leslie enlisted into the reserve of the Bedfordshire regiment, by January 1916 he was sent to join the Northumberland Fusiliers. He served with the 11th and 21st battalions, we are not sure exactly when he joined them or when he first went to France but we know he was wounded at some point because he was convalescing in Hadleigh in January 1917. He was back in France in July 1917 and at that time serving with the 20th battalion. The 20th Northumberland Fusiliers were also known informally as the 1st Tyneside Scottish, they had been raised in 1914 in Newcastle as a Pals battalion from Scots who had moved south. They had gone to France in January 1916 and their first major engagement was on the infamous first day of the Battle of the Somme where they suffered extremely heavy loses. It is likely that Leslie joined them when they were being regenerated. By September 1917 the 20th Northumberland Fusiliers were in trenches to the east of the Hargicourt, about 10 miles east of Péronne. They were facing the Hindenburg line where the Germans had withdrawn in March 1917. There were some scuffles, but it was relatively quiet with each side watching the other and sending out small reconnaissance parties at night. The war diary for the 20 September reports that their trenches were “lightly shelled at intervals during the day” and at 3.30pm “several mortar bombs fell” and at some stage that day Leslie Cocksedge was killed. He has a known grave in the Hargicourt British Cemetery and is remembered on the Hadleigh War Memorial. We hope that this page has been able to tell the story of Leslie Harold Cocksedge. If you know of any information which might help to add to the story then please get in touch.